2019 is going to be a big year in country music, Eric Church, the singer of such smash hits as "Creepin'", "Record Year", and "Round Here Buzz", is headed for new Double Down tour. This Eric Church tour schedule is set to begin in January at the CHI Health Center in Omaha Nebraska, and end in June at the Gorge Amphitheatre in George, Washington. The tour dates list consists of 19 stops, with each stop being two-night shows that allow him to showcase his varying musical tastes. Eric will be covering six albums worth of songs, so this concert tour is one that you are not going to want to miss in 2019. If you are a new fan of Eric, an old fan, or somewhere in between, you are going to have a fantastic time at this show. Eric knows how to put on a concert, he's lively, loud, and ready to rock and roll. This concert tour also has Eric all by himself, no opener, no second headliner, he plans to make the show all his own, and wow his audience each date with his soulful singing and rockstar attitude. During his last tour, in which he also had no opening act or another headliner, he realized how much he could connect with fans through the heartfelt music. He enjoyed that so much, that this new tour is almost a continuation of his last, but with the added bonus of seven hours of music instead of three and a half. 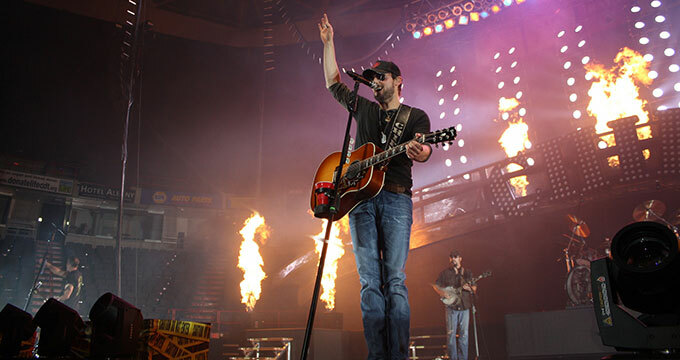 One truth that fans know about Eric Church is that he is a born performer. The way that his new 2019 Double Down tour is set up, two concerts in a row at the same venue, will give fans a fresh way to witness the talented musician in action. Just because you go to the first show in your city doesn't mean that you've seen all that Eric has to offer, either. Both dates will be unique from each other, and every other show in the tour schedule, plus his biggest fans will have the opportunity to get the best seats in the house, literally in the stage. Only those who are part of his fan club The Church Choir will have access to these special seats and be able to purchase their tickets before other fans. No matter which way you get to see this man perform, it's going to leave a lasting impression. This is the first tour Eric has gone on in eighteen months, and it comes tight on the heels of his new album "Desperate Man", which is an album that took him quite some time to write. His last album came out way back in 2015. Eric Church, ever the artist that he is, had a difficult time constructing his new album, he wanted it to be perfect, his fans deserve the best after all. Luckily with these tour dates we will for sure get to see Eric perform chart topping hits from his newest album at the concert, as well as the old tried and true classics. It will be magical to see this power house in action.